Asus' Chromebook convertible first appeared on our radar in late March, now it's finally here. On Monday, Asus announced the Chromebook Flip C100—a hybrid Chromebook with a touchscreen and a fold-back, Lenovo Yoga-style lid—was finally available for purchase. We received our initial look at the first mainstream Chromebook with a 360-degree hinge in late March courtesy of Google. At the time, the search giant said to expect the Flip in June along with Chrome OS 42, a software update that included an improved touch experience. 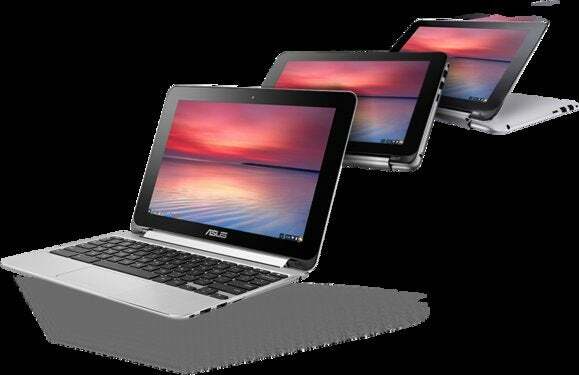 Both the June deadline and the Chrome OS 42 update came and went without a peep from Asus. Finally, however, you can get your hands on the device from online retailers—including Asus’ own eStore, Amazon, and Newegg—starting at $249. The final version of the laptop is basically what we saw back in March. It features a 10.1-inch IPS display with 1280-by-800 resolution, the Cortex A17-based 1.8GHz Rockchip RK3288 quad-core processor, Mali T764 graphics, 2GB or 4GB of RAM, 16GB or 32GB of onboard storage, microSD card reader, webcam, Bluetooth 4.1, an HDMI port, a pair of USB 2.0 ports, and 802.11a/b/g/n/ac Wi-Fi. Asus is promising up to 9 hours of battery life. The Flip’s keyboard is 97 percent the size of a standard clamshell laptop’s, but typing isn’t the big feature of the Flip. The key is its ability to transform from a regular laptop to a tablet for laid back Chrome-style couch computing. The story behind the story: Asus’ convertible Chromebook is the first convertible device we’ve seen that has a shot at the consumer market. Prior to the Flip, Lenovo rolled out the ThinkPad Yoga 11e Chromebook, a plus-$400 device aimed primarily at educational institutions. Tablet mode on the Flip will be nice for reading or watching video, but surfing the web is likely more trouble than it’s worth as Chrome OS is ultimately a point-and-click interface. For now, anyway. Google is gradually adding more touch features to Chrome OS and the touch experience is bound to improve over time.